The Dragon Tree ‘Dracena draco’ is a plant originally from the Canary Islands ( the Canary Islands Dragon Tree). Popular with landscapers due its dramatic form that makes a it great specimen tree. Smaller trees are readily available for sale, larger specimens can be expensive because of the slow growing nature or the tree. Adaptable in that they grow well in cooler climates as well as warmer area, and thus are popular from Melbourne to Brisbane, across to Perth. Dragon Trees can make a great decorative feature tree, with its spiky foliage a hardy long living tree, with some specimens hundreds or years old. Dracaena marginata is the ‘Red Edged Dragon Tree’. 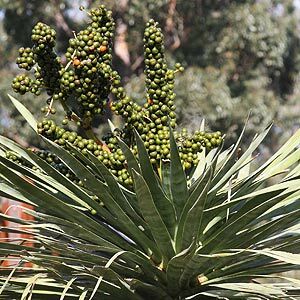 Dracaena Draco is drought tolerant once established and its strong architectural qualities make it popular with landscape designers. 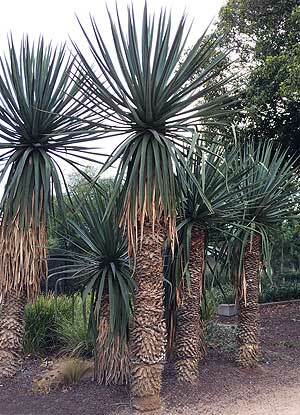 Draceana Draco or Dragon Tree (picture right) is a slow growing tree that requires full sun, a mature Dragon Tree can reach 10-12m with an umbrella-shaped canopy. Specimens are available with both single and multiple crowns, they do create very different effects in the landscape. A multi crowned tree can look great as a feature, single crowns can look good planted in groups. All will become multi crowned as they age. The very thick trunk and the spiky strap leafed foliage give the Dragon Tree a look of its own. A excellent alternative to palm trees.